Hello friends! The weather’s heating up and we’re ready to start planning for 4th of July celebrations, summer birthday parties, and family reunions. 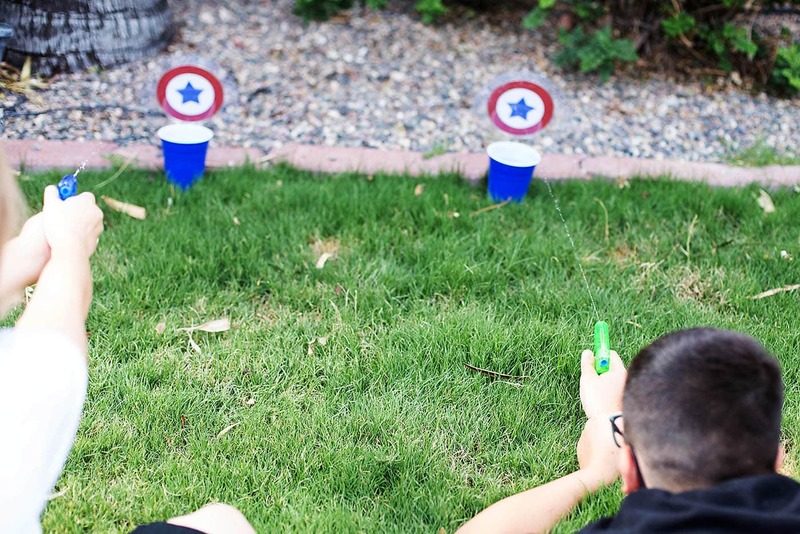 Awesome summer parties need awesome outdoor games and entertainment and we can’t wait to show you these amazing DIY backyard party games that will guarantee the best Summer party ever! 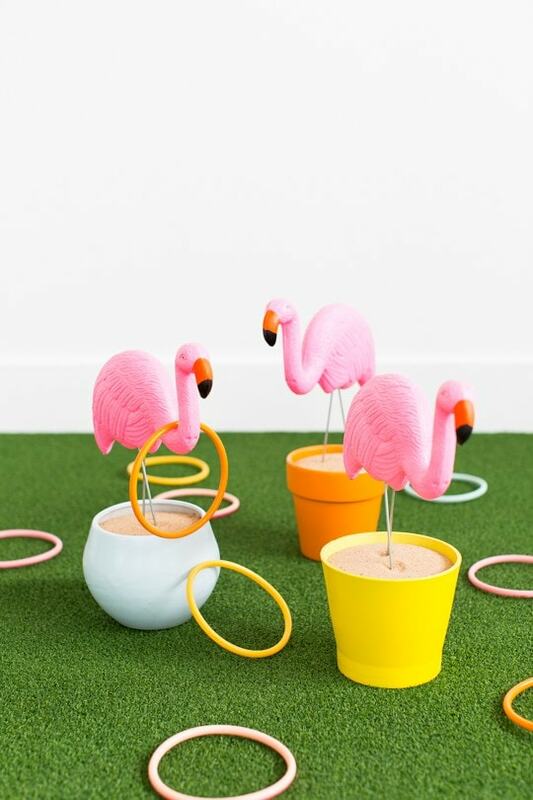 Colorful pots and bright flamingos are as eye-catching as they are fun with this easy DIY flamingo ring toss game from Sugar and Cloth. This game is perfect for tropical summer themes and simple backyard bar-b-cues. 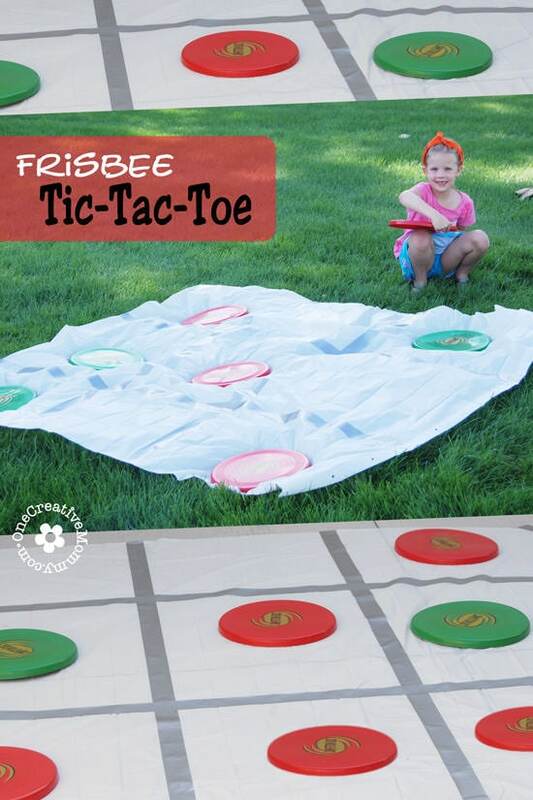 I can’t catch a frisbee to save my life, but this simple tic-tac-toe frisbee game from One Creative Mommy looks like something anybody can do. 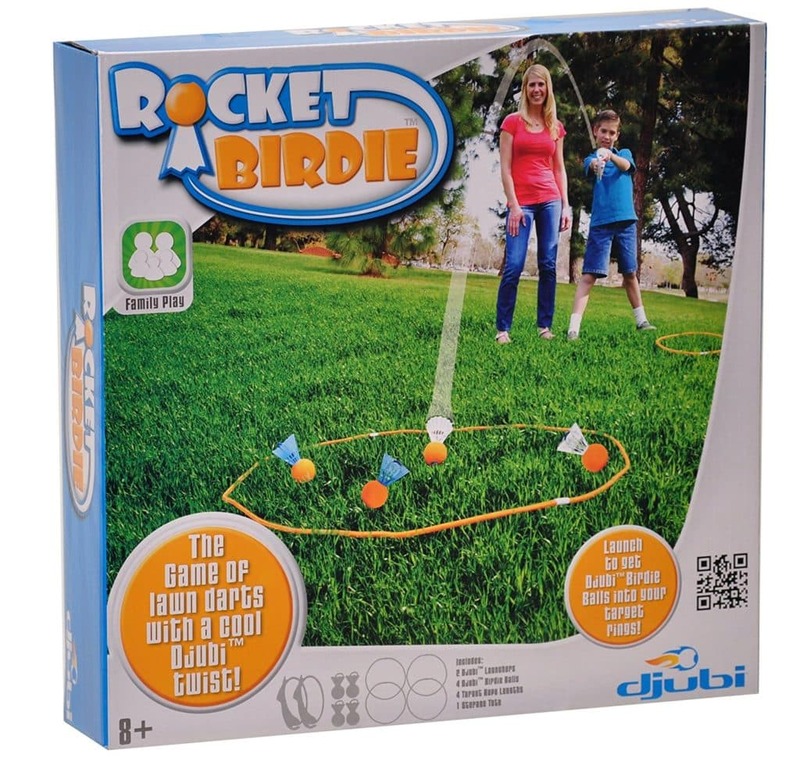 This backyard party game is quick and easy to put together and fun for all ages. 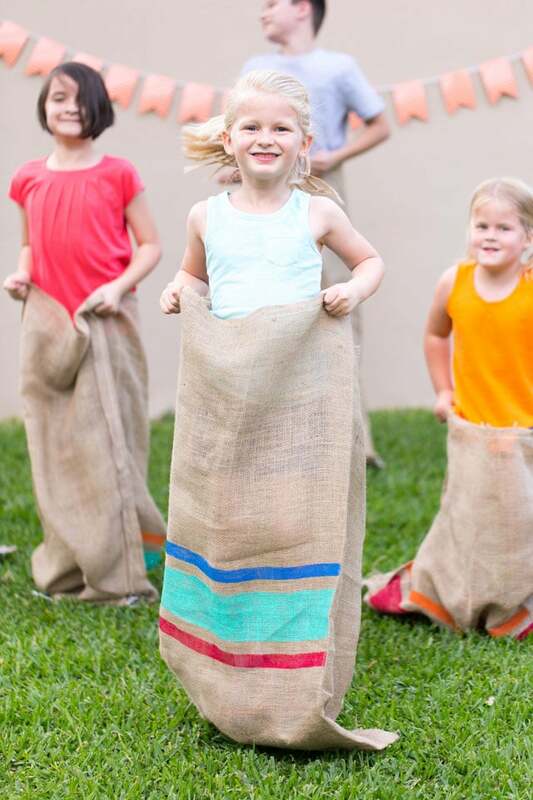 Does anybody still do potato sack races? If you haven’t done this in a while, put it on your list of things to do at your next party. 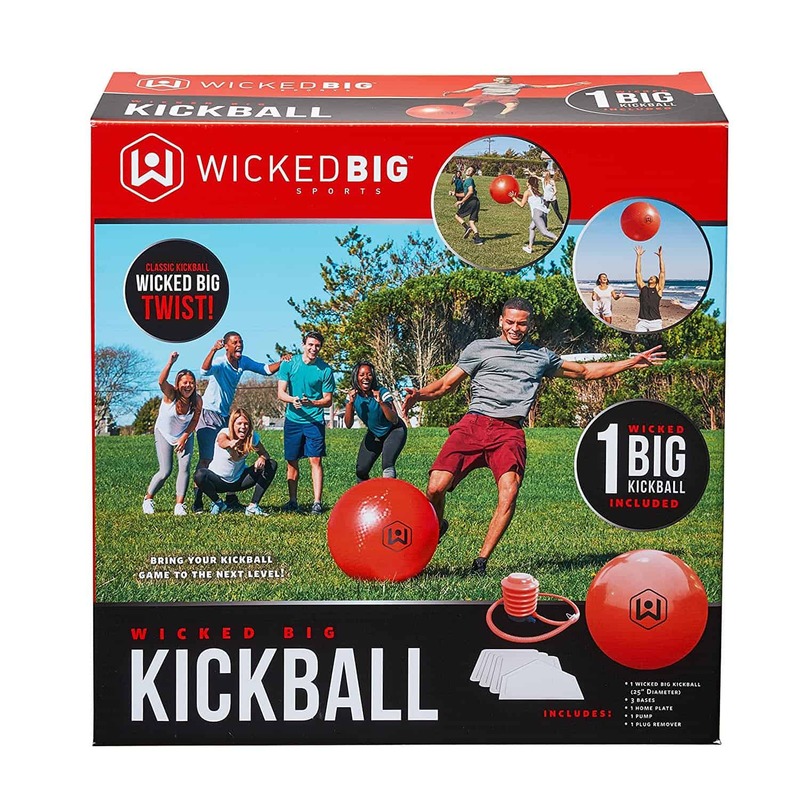 It’s definitely fun for kids, even more fun for adults who can barely fit into the little sacks and awkwardly hop across the yard, but the most fun is for the spectators who get to watch the spectacle in front of them. Design Improvised shows how some simple hand-painted treatments can add a little style to the potato sacks. 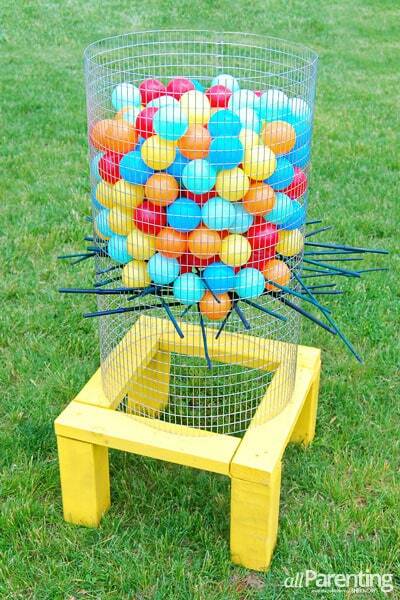 This is a super-sized version of the table top Ker Plunk game you might have in your game cabinet. Check out All Parenting for details on how to make this version for your outdoor party. My kids just learned how to play the “real” dominoes game (as opposed to the activity that involves lining them up in intricate patterns and then knocking them down) while we were visiting Old Salem. I was actually surprised at how much they enjoyed playing the game version and I think this giant yard-sized version of Dominoes would go over really well at an outdoor party since it’s something that is fun for adults and kids. You can visit Dream a Little Bigger to see how this set was made. I have to admit, I’ve never heard of this game before. 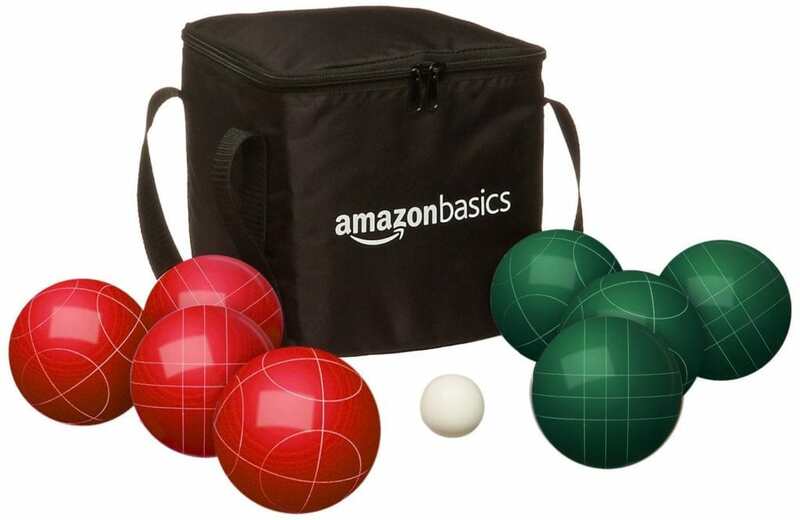 But, it says it’s the best lawn game ever. And, after reading the description on Let’s Get Together, I am seriously intrigued and feel the need to make this set right now and get a game going in our cul-de-sac just to see if it can live up to it’s claim. Have your played this game before? What are your thoughts? Click over and you can see what you need to make your own game, plus a video on how to play. 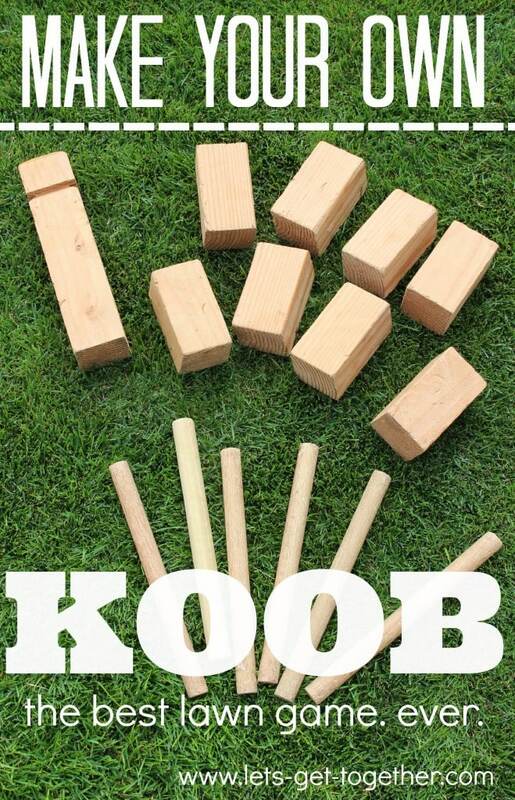 There is a set for sale on Amazon as well if you don’t want to bother with the wood-cutting (spelled Kubb if you want to search for it). 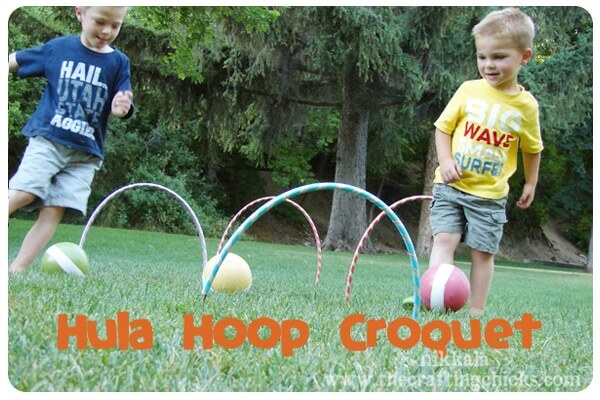 Croquet is a fine yard game in and of itself, but I love this hula hoop version from The Crafting Chicks which makes the game a little more kid-friendly. Grab some hula hoops and rubber balls from the Dollar Store and you’re all set. You have to check out all of the parts of this DIY backyard mini golf course from A Small Snippet. With a little bit of cheap indoor-outdoor carpeting a lot of creativity, you can make a totally fun mini golf course for your next backyard party. Ring toss is a wonderful DIY backyard party game, and I’ve got a few ring toss ideas sprinkled throughout this post. 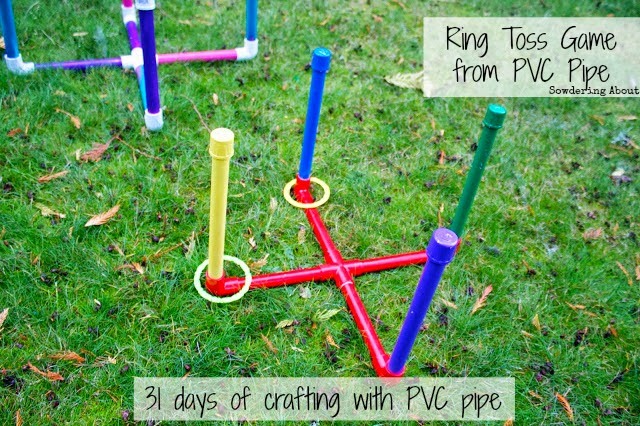 This ring toss game from Sowdering About is made from PVC pipe, so you’ll be able to keep it around for years of fun. We always try to have some water guns available for the kids at our summer get-togethers. I love this take on an old carnival game from All For the Boys. If you make a few of the target cups, you can have several people competing at once. The goal is to see who can fill up their cup the fastest! 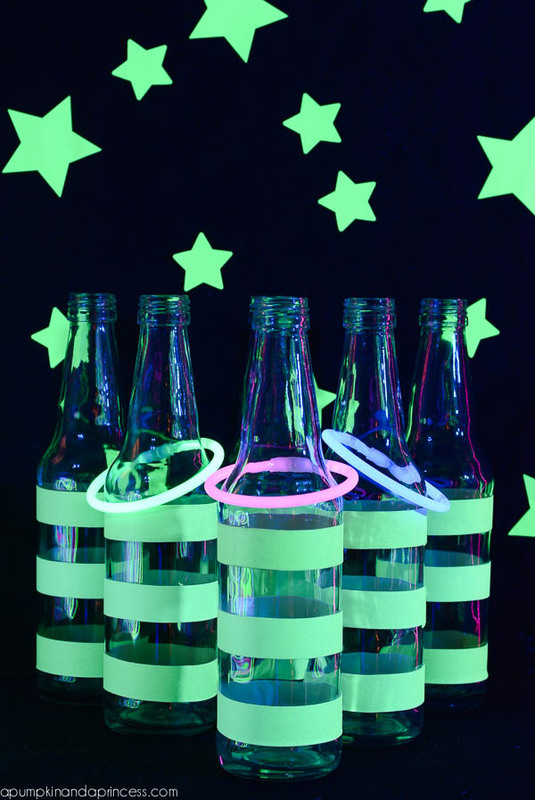 If you’re party is going to go late this summer, be sure to check out this awesome glow-in-the-dark ring toss game from A Pumpkin and a Princess. 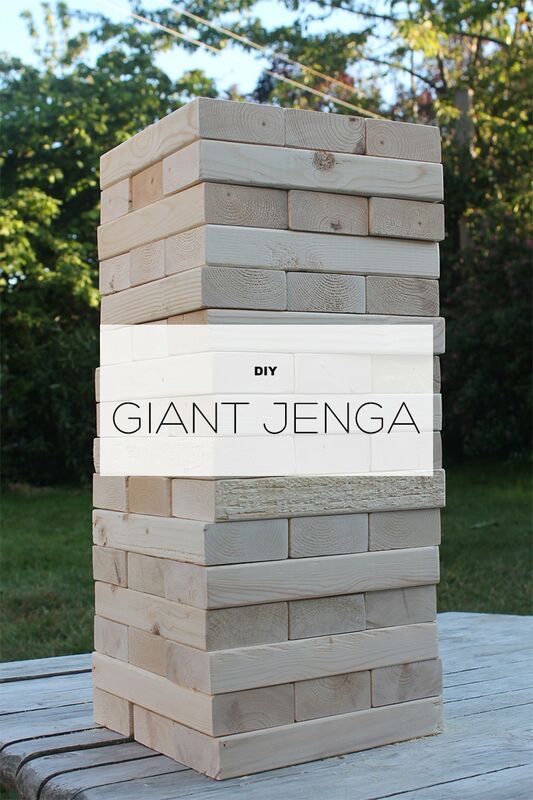 Jenga is another one of those games that can easily be scaled up for an outdoor party game. Just don’t stack it above your head! You can view the tutorial here. 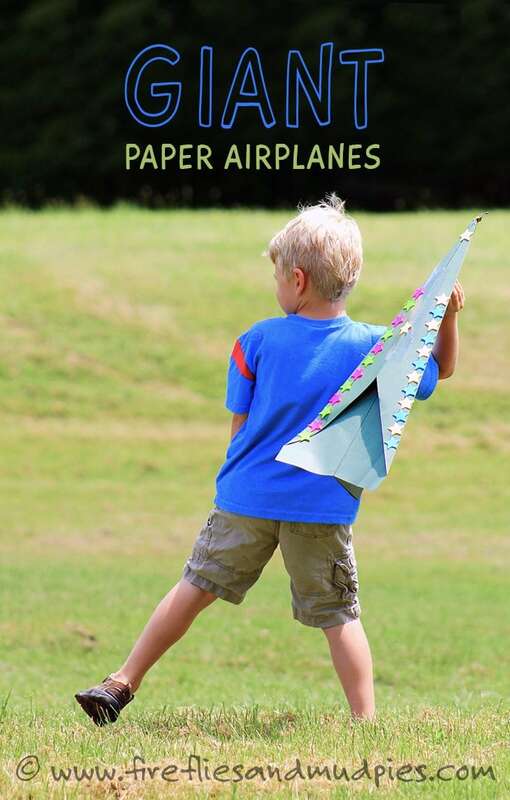 Paper airplanes are easy, inexpensive, and so much fun. 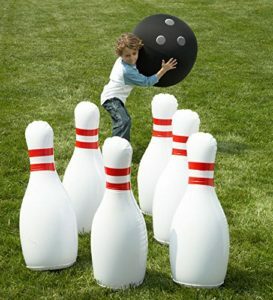 Scale up with some poster board and you’ve got a great outdoor activity for party guests! Fireflies and Mudpies shares their version. 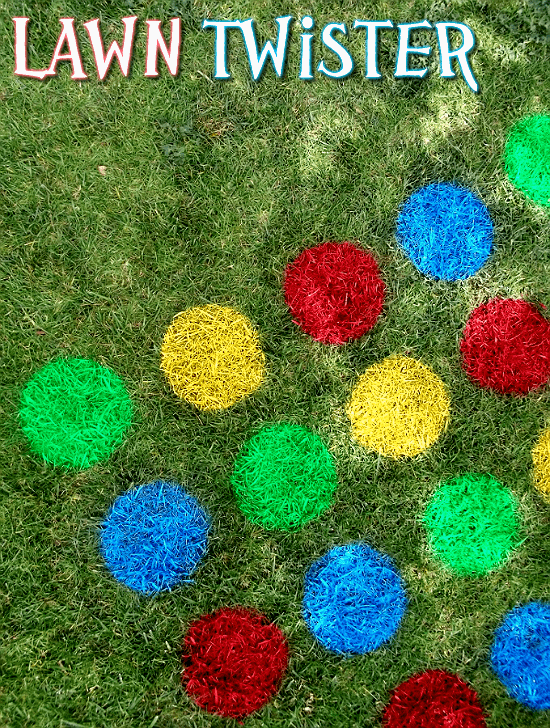 Bring out the old classic Twister game, backyard style, with some spray paint! See Mama Told Me Blog for the Lawn Twister tutorial. Make your own paddles with this easy how-to from Ziggity Zoom! 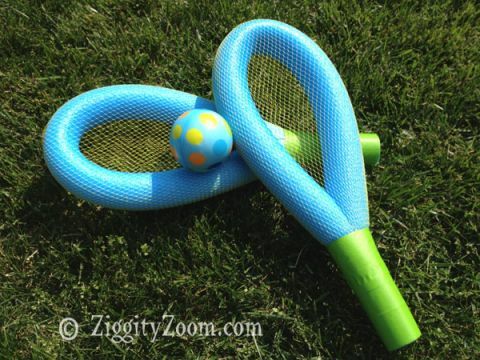 Kids and adults can bop around a rubber ball or a balloon with these DIY pool noodle rackets, or use them in the pool with a beach ball. I love these adorable painted cardboard rings from My Fab Land. 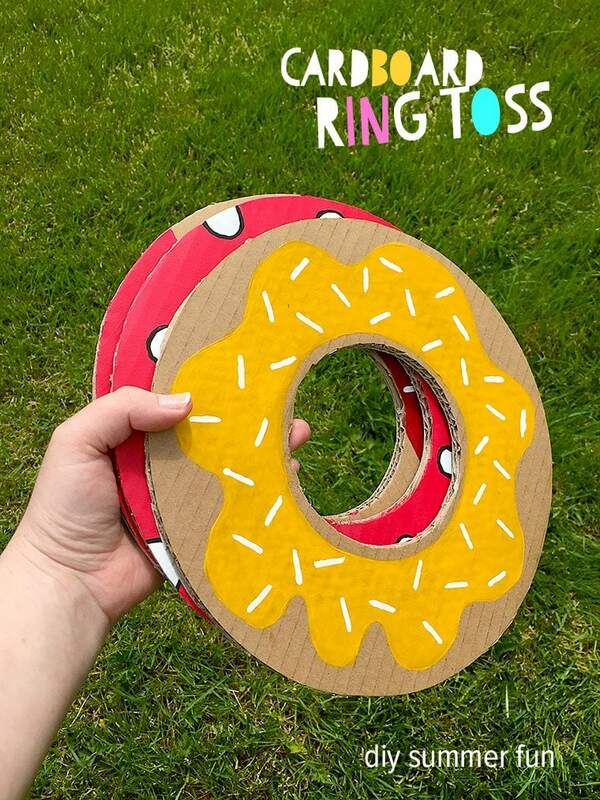 See how to make a cardboard ring toss game here. 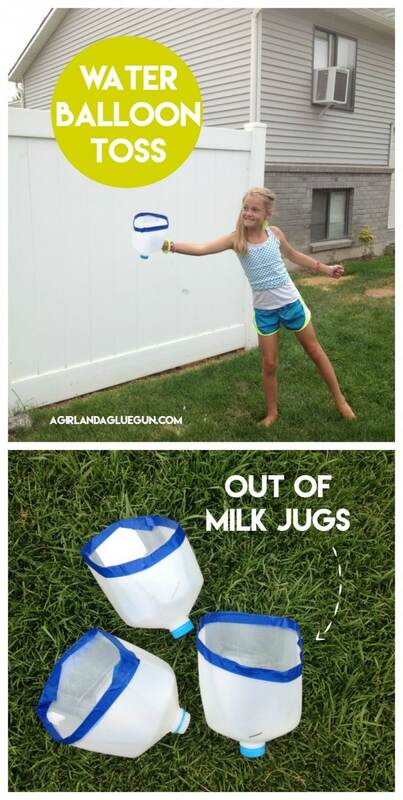 A Girl and A Glue Gun shares a fun and simple game you can make with repurposed milk jugs! 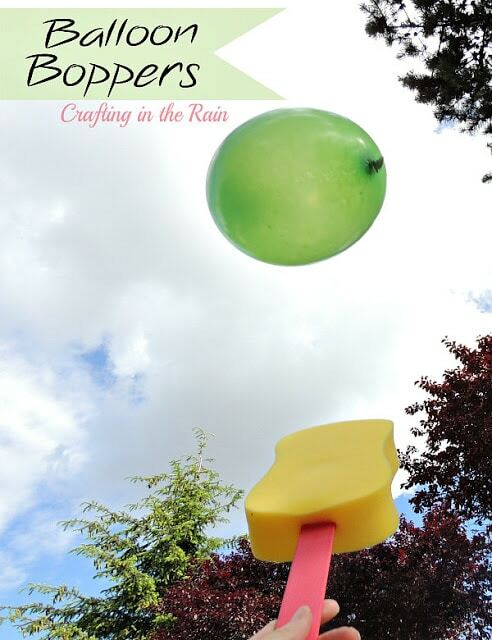 A few simple materials are all you need to make some foam paddles for balloon boppers! Crafting in the Rain has the details. Here’s another water squirter target game. 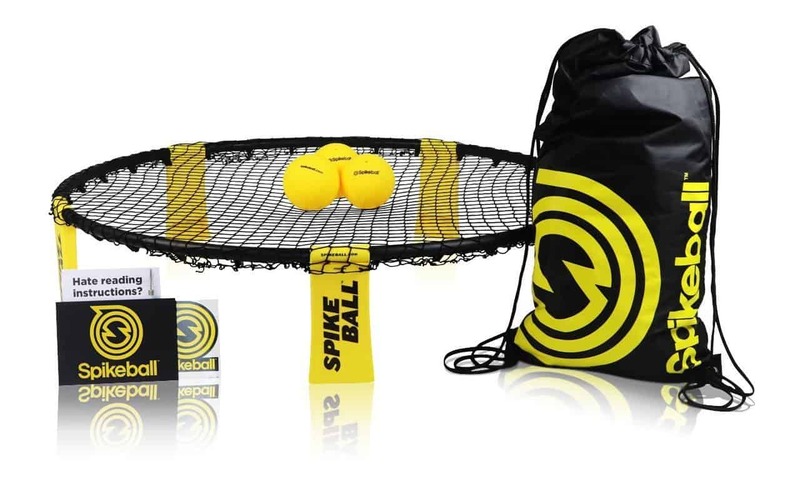 This can be a one person game or make it a competition by setting up a few stands and seeing who can shoot down the most ping pong balls in a certain amount of time! See how it’s made at Planet of the Apels . I am amazed at all of the amazing things people come with to do with pool noodles! The Joys of Boys shares how to make this fabulous target stand. 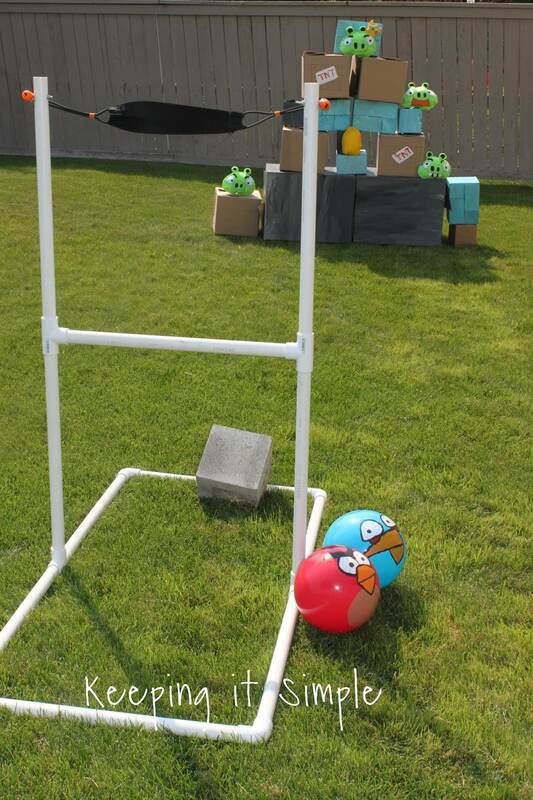 You can incorporate a stand like this in a variety of DIY backyard party games: use it with for throwing pool noodles or for football throwing, or get creative and see what else you can come up with! 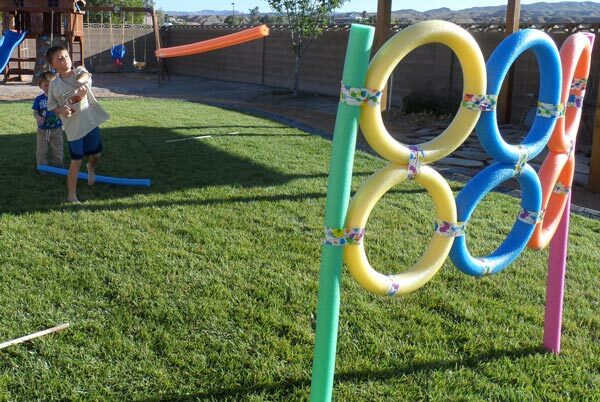 Check out this awesome DIY slingshot made with PVC pipes from Keeping it Simple Crafts! 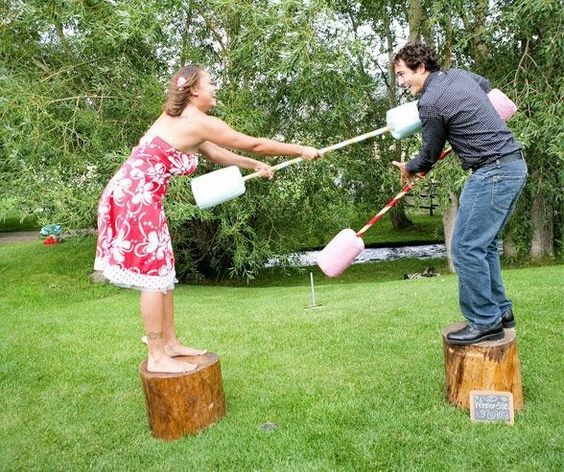 Guests will have loads of fun knocking down cans or boxes, Angry Birds-style! This is a super-fun game for the young ones, or those who are young at heart (i.e. not for anyone who might fall and break a hip). If you don’t have stumps, you can use step stools, buckets, milk crates, etc. I’m not sure what they’re using in this photo, but I think the best bet to minimize injuries is to go with foam pool noodles. You can even turn them into swords with these sword handle connecters! Whoever knocks the other person off first wins! 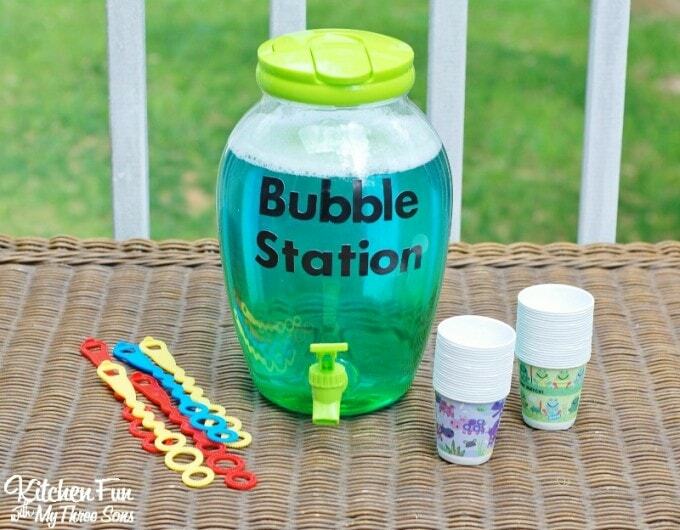 A DIY bubble station like this one from Kitchen fun With My 3 Sons will keep kids happy for hours! As long as they can keep filling those cups up they’ll be having a blast with their bubbles. 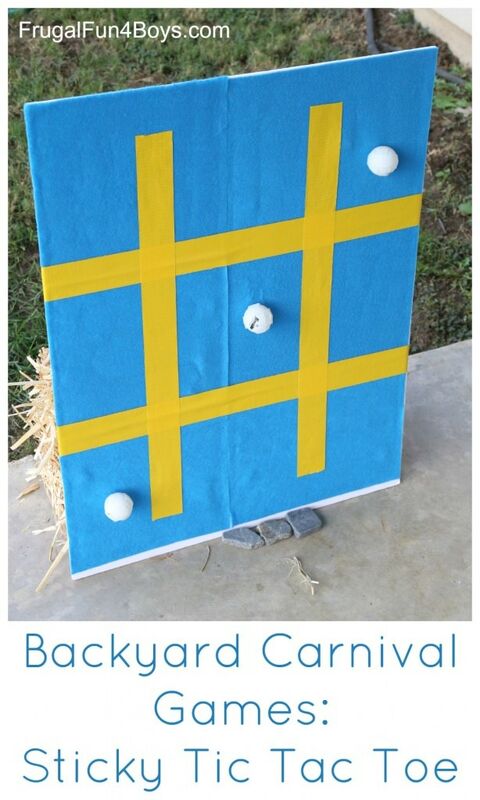 Here’s another great way to make an outdoor tic tac toe board. Frugal Fun 4 Boys and Girls has the details on making your own DIY ping pong Tic Tac Toe game. Water balloon baseball is definitely a thing and is so much fun to play. For your next backyard party, fill up some water balloons with different amounts of water so that some will burst easily and some will just be bouncy. 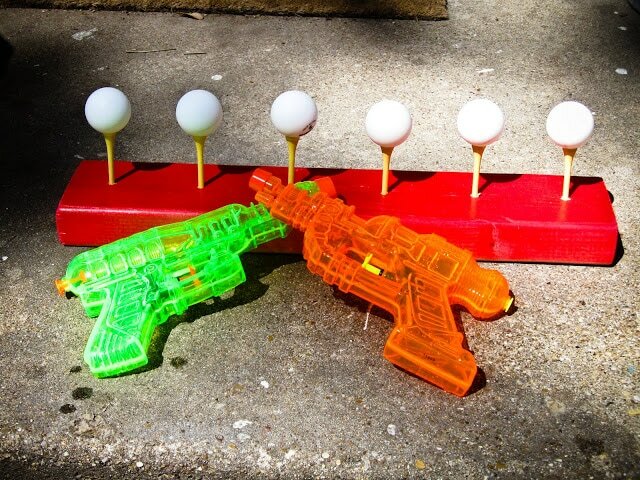 Players won’t know which ones will burst on contact and which water balloons will make a great play! Your guests must be willing to get a little wet with this game so save it for the hottest of hot summer party days. See Overstuffed Life for this game plus some tips on getting the kids to clean up the balloon pieces. Also, check out our post on DIY Backyard Play Areas for more amazing backyard ideas. If you don’t already have it, you can Try Amazon Prime 30-Day Free Trial . Pin this image to easily find these great DIY backyard party ideas again! 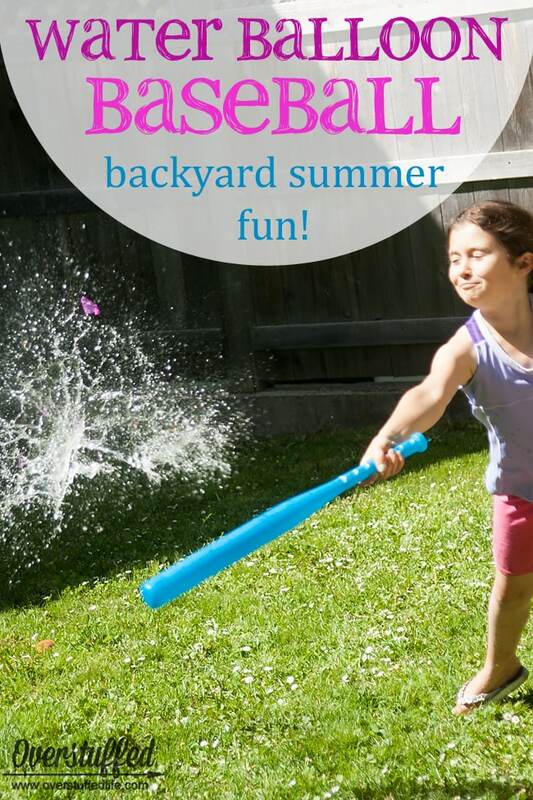 Best tips i’ve seen so far for summer fun! Definitely trying most, if not all of these at my next cookout! Thanks! The pool noodle gladiator competition looks awesome. Thanks for sharing! Yes! Super-fun for kids and adults for sure. Thanks, Marc.